Red Alert all ALIPAC Allies! It is time to charge against Amnesty in DC with all the people and might we can muster using ALIPAC's new poll and strategy to take the lead and #StopDACA Amnesty for illegals before the Feb 8 Amnesty vote deadline in the Senate! ALIPAC's new professional poll shows that GOP primary voters favor America's existing immigration laws over changing the law to give DACA Amnesty to illegals 2 to 1! We plan to formally release this poll and the exact readings Monday morning. But just releasing our poll to the media (Phase-2) is not enough. 1. Make calls to all 300 GOP lawmakers in DC carrying our message and poll information Monday morning at 9 am and again on Tuesday, Wednesday, and Thursday. 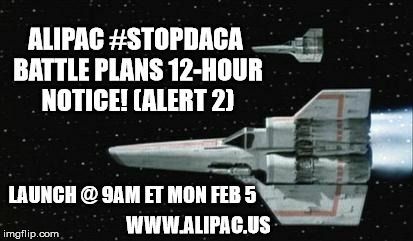 We need 4 days of numerous intense calls to help ALIPAC deliver the knockout punch against DACA Dreamer Amnesty legislation! 3. We will need ALIPAC volunteers to search out existing and potential GOP primary candidates with our poll information and press release. The filing periods for Congress are open across America right now, and our poll shows that candidates on our side who oppose Amnesty in favor of our existing laws can defeat pro-Amnesty incumbents by a 2 to 1 advantage! Please adjust your schedule as best you can to help us with this make or break effort! This is the first time in our history ALIPAC has commissioned a professional poll and used this tactic to defeat Amnesty. Our success or failure with this new political strategy will be based on the numbers of calls you make, offices you help us visit, or DONATIONS YOU MAKE (HERE). Rally! Rally! Rally to us, Americans! The time to charge against Amnesty is NOW! ALIPAC is taking the lead and charging into DC to #StopDACA! PS: We repeat --we must raise a matching $1,000 today to pay for the poll, the travel, the packets, the press release, the ads, gasoline, etc. 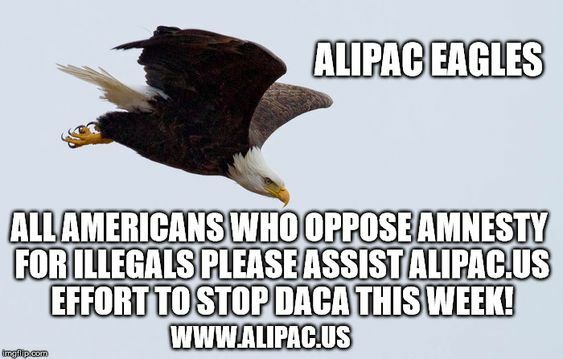 for our team of ALIPAC Eagles to hit the ground and deliver our message directly to lawmakers before the Feb 8 Amnesty vote deadline! Please DONATE now to make our fight possible. Last edited by ALIPAC; 02-04-2018 at 01:43 PM. In 12 hours we will launch Phase 2 & 3 of our new and innovative Knock Out DACA Amnesty plan. We still have $450 to raise by sunrise for this plan to have a chance, so please (DONATE HERE) so we can come out swinging hard against Amnesty at 9am ET! This will be our most challenging battle in the 14-year history of Americans for Legal Immigration PAC! Our success or failure will likely depend on how many of you we can successfully inspire into action on our behalf. Together, we have successfully fought and defeated Amnesty for illegals legislation in Washington 5 times since 2004 while facing incredible obstacles, this time they have the card game stacked against us and are very likely to pass Amnesty unless ALIPAC can deliver the knock out blow once again! The dramatic results of ALIPAC's new, certified professional poll from the Barometer Polling Company can give us the power to change the tide of battle in Washington DC this week if enough of you will follow our call to action!!! We need every activist we can get ready to call Congress in 12 hours around 9 am Monday Feb. 5, 2018 when our press release and poll results go out to the nation! Our goal is to generate hundreds of calls to each of the approximately 300 Republican lawmaker offices within the first 48 hours of our launch. Please be ready to jump on the phones with us in 12 hours while rallying others to help us fight! We also must raise another $450 to meet our $1,000 matching offer from a generous supporter by 9 am tomorrow, or we will have to cancel our Phase 3 plan to deploy ALIPAC activists into DC on Tuesday and Wednesday to hand-deliver our powerful poll results to GOP lawmaker offices. If you want to join our effort in DC, email WilliamG@alipac.us immediately. Please be ready to rumble at 9am ET Monday Feb 5! WE NEED VOLUNTEER CALLERS FROM ALL 50 STATES! This is the time when our efforts can have the greatest chance of stopping the current DACA Amnesty deal set to go down in DC this week! PS: If you are using a mobile device, donating is easy using this link..
Last edited by ALIPAC; 02-04-2018 at 09:12 PM. AMNESTY RED ALERT: Pelosi Pushing Now Time to Push Back! Time To Charge Against Amnesty! ALIPAC RED ALERT! AMNESTY WARNING! ALIPAC Pre RED ALERT! Go Time in one hour!